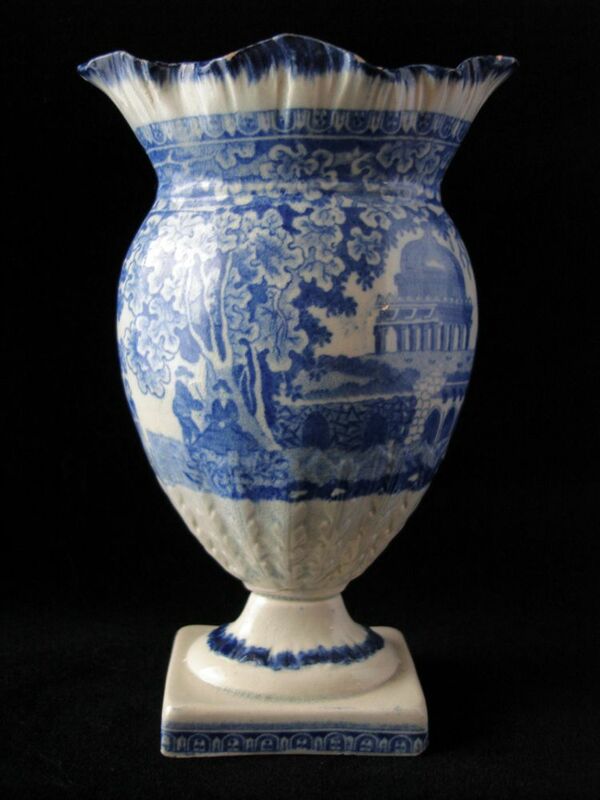 The antiques dealer told me it was a posy vase. I learned it is also known as a pouch vase. The shape looked a bit formal for a posy, but I liked it. Posy vases come in different sizes and patterns, but the shape is always like the one seen here. They are usually molded and painted at the opening of the vase in a style known as shell edge. 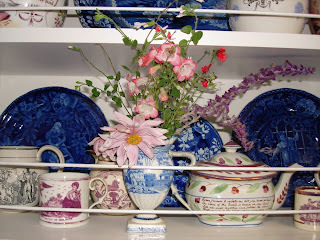 Mainly printed in blue, I have seen black and brown examples and have owned a lovely pink lustre (hand-painted) vase. The pattern below is Monopteros by John Rogers & Son (1815-1842). It probably dates to around 1820. I decided to use the posy vase in the manner for which it was intended, so I picked some flowers from my garden. They made a lovely informal posy. If you are interested, the pink daisy-like flowers are Japanese anemones, the pink tubular flowers are penstemon, the purple flower on the right is salvia leucantha (Mexican Sage), and the small red and white flowers are salvia microfylla (Hot Lips). 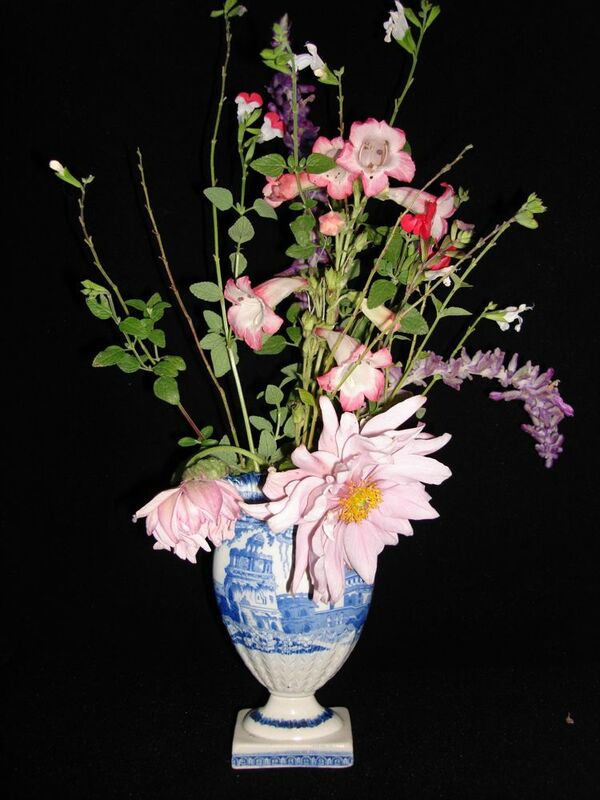 Posy Vase used as intended. Unfortunately, it leaked. I thought the above photo looked much too formal, so I put the posy vase on a shelf cluttered with pottery. Posy vase on a shelf full of pottery. Remember that I live in earthquake country so the dowels are a nod to safety. 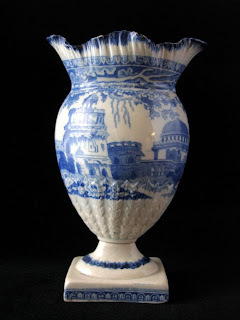 Here is a photo of the Monopteros pattern on a flat item. 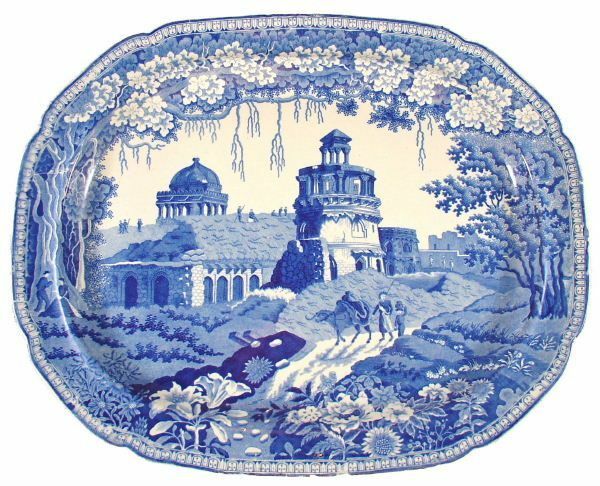 Are there any difference between the pattern on the vase and the pattern on the platter?